This 600W, 1RU FM Exciter is the perfect piece of equipment for you. Built in 4-band DSPX audio processing, Ethernet control, RDS Encoder and FSK IDer reduces the need for any additional equipment - sound great right out of the box!. Integrated multiband DSP audio processing, RDS Encoder all standard! Ethernet connection and built-in Web server coupled with intelligent alarms & email alerts – Remote Management has never been simpler! 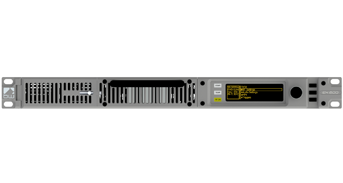 New from BW Broadcast - the EX600 EXciter. The EX600 is built upon the foundations of BW Broadcast’s legendary exciters – clean and great-quality – but adds Direct Digital Synthesis (DDS) to bring performance to a new level. The EX600 features an integrated multiband DSPX audio processor, that means stations without a separate processor sound great – right out of the box! This audio processor features four band program dependent limiting, a wide band AGC with intelligent gating, parametric EQ and shelf bass enhancement, multi band distortion-controlled clippers and a powerful composite clipper with pilot protection. All this allows you to tailor your sound for your format -for maximum impact. An integrated ITU-R 812 MPX power limiter ensures you meet modulation regulations. The EXciter range is based on BW Broadcast transmitter architecture experience gained over many years. BW transmitters are the most intelligent on the market – with telemetry and remote control included - featuring a built-in web browser. With no software to install and no reliance on Flash support, the EXciter platform gives you easy access to setup and monitoring such as email alerts, SNMP, silence detection, and advanced alarms. The unit will email you if it has a problem, and keep a log of any issues to be investigated. You can also adjust settings remotely if required. A standard, configurable parallel GPIO interface is provided for interfacing to your station remote control equipment. This will alert you to issues and offer solutions to keep you on air. For example - it can be configured to switch on back-up audio or reserve transmitters should it detect a problem. All EXciters have inputs and outputs you would come to expect of with a premium product. Featuring AES3 audio or composite/MPX over AES192, analog left and right, and 2 configurable composite inputs and outputs. Composite inputs and outputs can be configured as MPX, SCA, RDS or pilot sync. An FSK ID keyer as standard for translators removes the need for external hardware for hourly audible announcements, and offers broadcasters a one-box solution for their translator sites. Integrated Dynamic RDS is now standard on-board. Listeners now expect to see RDS data on their radios featuring full station, music and advertising related information. The EXciter platform includes a powerful dynamic RDS system allowing you to maximize the impact, and deliver value for your advertisers from a single box solution.